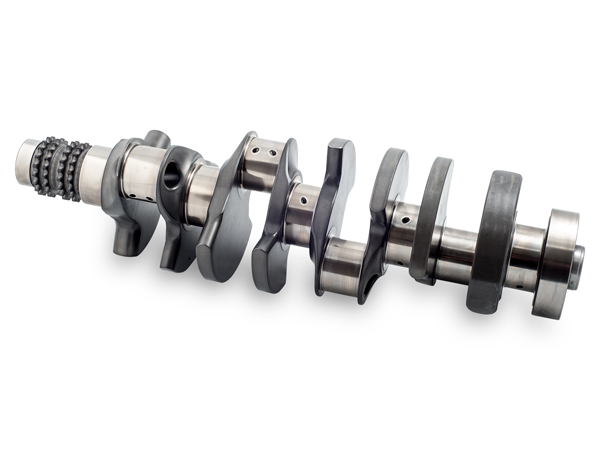 The VAC S38 3.8L - 4.1 L Stroker crank has been properly designed to ensure performance, durability and reliability. Our VAC cranks are made by a leading manufacturer in the USA to beyond OEM Motorsport quality. This crank is machined from the highest quality billet steel alloys and properly nitrided- running in dozens of successful race cars around the world! We have many race teams running this crank with great success. It is proven to win in the most grueling 24-Hour endurance races as well. Reliability and output are top notch! Our crank maintains a lightweight design and offers gains in torque to get you out of corners faster, and horsepower to widen the powerband and get the advantage in the straightaway's. Some customers have even used our crankshafts in forced induction builds. Whatever your goal, VAC parts and advice will help you achieve your goal. Consider our full system 'VAC Stroker Kit' for maximum performance and reliability. All components have been tested and run together in our VAC built engines in this configuration.